I like to thank Maria Margaronis and Mark Burman for this beautiful program. It was pleasure for me to take part in it. Thank you also very much for supporting#FamagustaEcocityproject. I loved the narrative, i adored the selected musics. 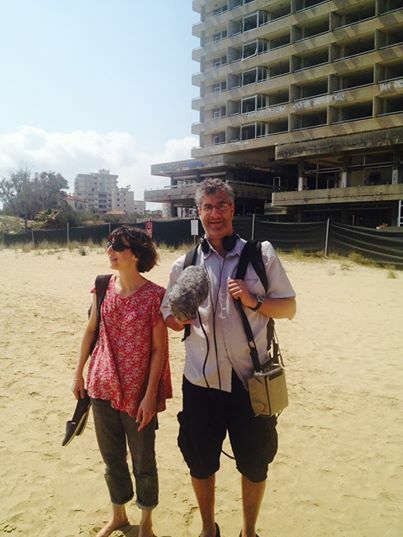 Maria Margaronis and Mark Burman over the abandoned and forbidden coastal strip of Varosha. The surreal curtain (background) of my childhood. After fifty years of division policed by UN peacekeepers, there is new hope for a settlement on the island of Cyprus, once known as the “graveyard of diplomats.” Writer Maria Margaronis travels through the Greek Cypriot south and the Turkish Cypriot north to understand how this tiny country torn in two and why has it proved so difficult to stitch it back together. In the 1950s, under British colonial rule, members of the Greek Cypriot majority launched the violent EOKA campaign for Enosis, or union with Greece. Turkish Cypriots, under threat and enlisted for help by the British, mounted a counter-offensive for partition. Britain withdrew in 1960, leaving an independent state unloved by its citizens. By 1963 violence had broken out again; the capital was partitioned and Turkish Cypriots withdrew into separate enclaves. In 1974, the military dictatorship in power in Athens overthrew the Cyprus government to declare Enosis; Turkey invaded and took over a third of the island. Some 200,000 Cypriots became refugees in their own land; there are still missing people from both communities. Since then, repeated attempts at a settlement have failed. The Greek Cypriot Republic of Cyprus is an EU member; the Turkish Republic of Cyprus is unrecognised by any country but Turkey. The two are separated by a UN-controlled buffer zone, and until 2003, there was no crossing and no direct communication between them. Fifty years ago Cypriots lived together as neighbours; now they have separate histories and no common language. And yet, there are plenty of contacts, friendships, even marriages between them; the divided island has been at peace for 40 years. Maria talks to inter-communal couples, to soldiers who once shot each other and are now fast friends, and to pragmatists on both sides about what it is to live this surreal paradox. She visits the frozen spaces of the UN buffer zone like Nicosia Airport where time has stood still in 1974, and encounters the frozen spaces of history and memory, where shards of grief still linger: a school commemoration of the EOKA struggle, a Greek Cypriot refugee settlement & the ruins of the former luxury holiday resort of Varosha. What does it take for people to leave the past behind? Why might they cling onto it? And, in a world that’s changed completely since 1974, can the inhabitants of this strategically located island ever really hope to determine their own future?